In this article we will see how coil fed laser cutting systmes are more efficient in different application ensuring a better material optimization than traditional systems using standard sheets. The following case history compares in detail the same application of sheet metal production processed by traditional laser cutting system or a coil-fed production system and in the end we will analyze both the material utilization and the final amount of scrap. In the last five years, coil fed punching systems and laser cutting systems are enjoying an increasing significant success. The reasons are multiple: they allow for a simple automation of the process, the cycle time is not dependent on the operators skill, the cycle time for production is faster and, above all, the processing from coil allows for an optimized nesting with very high material utilization. Many companies, though, acknowledge this huge advantage only after the purchase of the machine, when they compare the reduced scrap amount with the scrap generated by the traditional sheet fed processes. We have already calculated the consequent savings in labour and material in a previous case study, regarding coil fed punch/laser machines. This new article analyzes the improvements in the material utilization in a different case: the company is working in the HVAC field, and a particular casing requires multiple parts to be cut as an assembly kit from galvanized steel. Today, the working cycle requires to cut the parts from 12 sheets with dimensions 3660x1525mm. As we can see from the pictures hereunder, in some of the sheets the amount of scrap is over 30% . The material is 1,5mm galvanized steel: the total amount of material to produce the parts can be calculated with the below table. As it is evident from the images, the production of long parts and panels obliges our customer to position the long parts and panels first, and then try to optimize the sheet usage by positioning other smaller parts. With the coil fed nesting, it is possible to optimize the parts on sheets that have variable length, in order to reduce scrap to a minimum. The horizontal cut in the sheet is provided to deliver the sheet with the produced parts to the sorting position. Here it is important to look at the total amount kg of material for the production of the same kit, compared to the sheet fed laser nesting. We observe a total of 78,4kg less material per each assembly kit with the coil fed laser, corresponding to exactly 10% less steel for the same production. In our previous article, company Elleci reached a total scrap less than 3% . This further increase in the material utilization comes from the use of coils that are slit to the exact width of the product. This way of processing is possible when we need to produce high quantities of panels with the same width, and variable lengths, typically OEM producers. 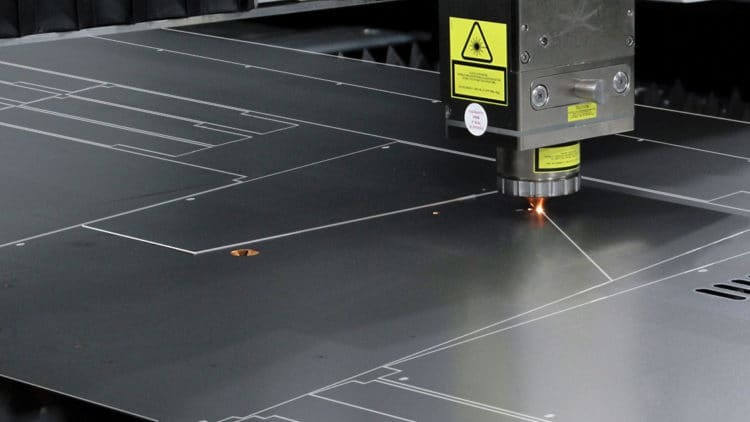 When producing long parts and panels, nesting on traditional sheet fed lasers has constraints that either produce big amounts of scrap, or force manufacturers to keep many different formats of material in stock. The coil fed laser, having the possibility to nest on a virtually infinite length, offers many more ways to nest the parts. In the present case study, only 42 meters of strip was used to complete the production. The savings on material for the manufacturer can be huge; to this we must add the savings in labor and production time: early adopters are enjoying all the advantages of this innovative technology to consistently improve their earnings.